Bush addresses the country from the White House. Unpopular but unbowed, President George W. Bush defended his tumultuous two terms in a farewell address to the nation Thursday night, claiming a series of successes at home and abroad. Reaching back to the Sept. 11 attacks, when the public rallied behind him, Bush declared the United States will "never tire, never falter and never fail." Leaving office with the highest disapproval rating since Richard Nixon, Bush said, "You may not agree with some tough decisions I have made, but I hope you can agree that I was willing to make the tough decisions." It was his final public appearance until he greets President-elect Barack Obama on Inauguration Day at the White House's North Portico. Bush called the inauguration of Obama, the first black president, a "moment of hope and pride" for America. "Standing on the steps of the Capitol will be a man whose story reflects the enduring promise of our land," he said. "Facing the prospect of a financial collapse, we took decisive measures to safeguard our economy," he said. "These are very tough times for hardworking families, but the toll would be far worse if we had not acted. All Americans are in this together. And together, with determination and hard work, we will restore our economy to the path of growth. We will show the world once again the resilience of America's free enterprise system." An audience of about 200 people was assembled to listen to the speech at the White House. They include about 45 people chosen for their personal stories, a practice normally reserved for a State of the Union address. The venue was a break from farewell addresses by Presidents Bill Clinton and Ronald Reagan, who spoke to the nation from the Oval Office. "Like all who have held this office before me, I have experienced setbacks," said Bush. "There are things I would do differently if given the chance. Yet I have always acted with the best interests of our country in mind. I have followed my conscience and done what I thought was right." 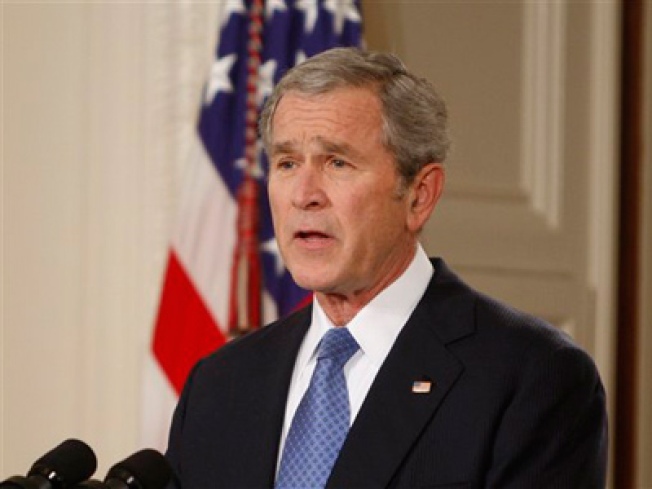 Bush also prodded the nation to lead the cause of freedom and maintain its "moral clarity" in what he described as a choice between good and evil. "I have often spoken to you about good and evil," he added. "This has made some uncomfortable. But good and evil are present in this world, and between the two there can be no compromise." Not all presidents give goodbye addresses. Bush's father, President George H.W. Bush, did not. But the president's advisers said Bush wanted to thank the nation for the opportunity to serve and defend his legacy in his own terms. "There is legitimate debate about many of these decisions, but there can be little debate about the results," said Bush, who also reiterated his belief that spreading human liberty and freedom offers an alternative to extremism. "America has gone more than seven years without another terrorist attack on our soil." Critics claim that while there has not been another attack on U.S. soil, the number of terrorist acts around the world has increased, Iran has gained influence in the Mideast, North Korea still hasn't verifiably declared its nuclear work, anti-Americanism abroad has emboldened extremists' recruitment efforts and a safe haven for terrorists remains along the Pakistan-Afghanistan border. Reflecting on Sept. 11, Bush warned Americans not to become complacent about the threat from terrorists. "As the years passed, most Americans were able to return to life much as it had been before 9/11, but I never did," Bush said. "Every morning, I received a briefing on the threats to our nation. And I vowed to do everything in my power to keep us safe." Trumpeting his domestic record, Bush said he has presided over higher standards in public schools, a new Medicare prescription drug benefit, lower income taxes, more help for people suffering from drug addiction and the appointment of two justices to the Supreme Court. "We have faced danger and trial, and there is more ahead," Bush said as he passed off a huge set of challenges to Obama. "But with the courage of our people and confidence in our ideals, this great nation will never tire, never falter, and never fail."